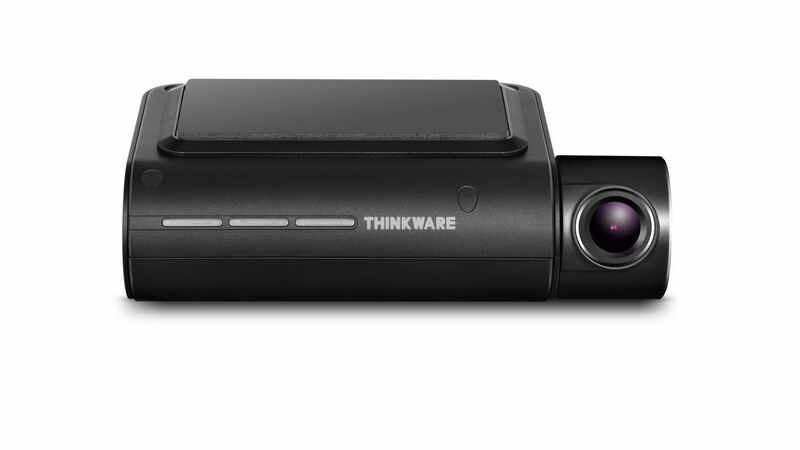 Thinkware’s £329 dual-channel Dash Cam F800 Pro is a somewhat mild improvement over the F800 we reviewed last year, offering enhancements such as better power management for hard-wired installations and a different color scheme, while retaining the best-in-the-business night captures. The new feature that truly differentiates the F800 Pro from the older version is Thinkware Cloud, which allows you to share videos uploaded to your phone with other devices via Thinkware’s web portal. However, the Cloud feature is unwieldy and too phone-reliant for professional use, making it more of a perk than a game-changer. 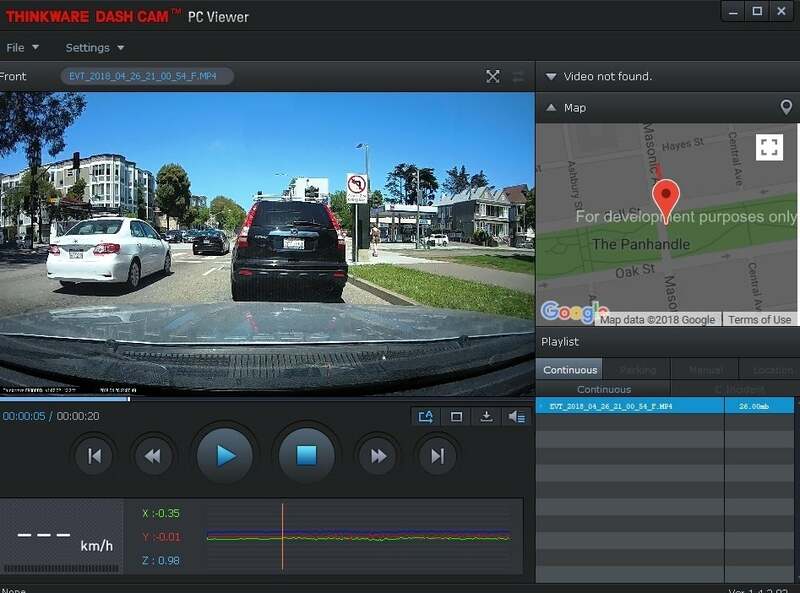 Like most of Thinkware’s high-end dash cams, the F800 Pro lacks a display, instead relying upon your phone for visuals, configuration, offloading video, and other interactions. If you’re phone-centric, you’ll like it. If you’re not, you probably won’t. 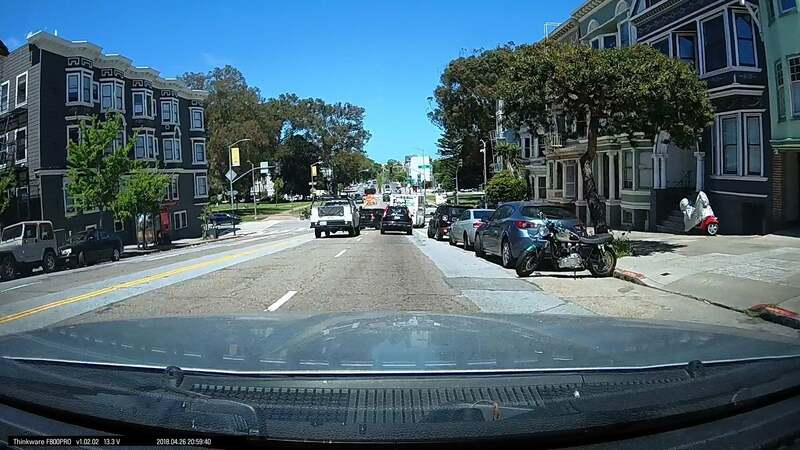 The F800 Pro is a bit on the large size for a dash cam, measuring approximately 1.1 x 2.5 x 3.25 inches–that last being 4 inches if you include the 140-degree field of view, rotate-able camera, which sticks out to the side. The gray-and-black color scheme gives it a more serious demeanor than the F800, and a more modern appearance than the older F770. The right side of the camera is home to the AC jack and a micro-USB port. However, the USB port is not for connecting the unit to a computer–it’s a video input for the optional £100 rear camera. The rear camera is £10 cheaper than last year, and the new model offers 1080p resolution with the same night-friendly Sony STARVIS sensor as the front. Still, adding it to the package will bring you up to £450 with tax. On the top of the camera you’ll find the slot for the Micro SD card (Thinkware provided us with a 32GB card and SD adapter) as well as the reset button, while the camera is on the left side. The F800’s camera is extremely close to the windshield to reduce distortion, and swivels in the vertical with a range of about 90 degrees. Tip: Attach the sticky mount to the camera, then download and use the Thinkware Cloud app to align the camera when you place it. The adhesive is rather strong, and redoing it isn’t fun. Also, put the mount in the fridge before you remove the backing tape, which is tricky to remove at room temperature and above. As I pointed out above, the big distinction between the F800 and the Pro is cloud connectivity. Once you’ve linked the camera with the phone via Wi-Fi, which eventually winds up with the camera logged in to your phone’s hot spot, you’re set to go. Transfers to the phone (and then to other devices), at least in my testing, were manual only–despite an entire settings page dedicated to automatic transfers that you see below. Support verified that this is currently the case. I also didn’t see any kind of notification triggered by impact, which is a bit puzzling, as there is real time geo-fencing with up to 20 zones. With geo-fencing, reports are sent when vehicles enter or leave a zone. There’s a corollary locate-vehicle function. 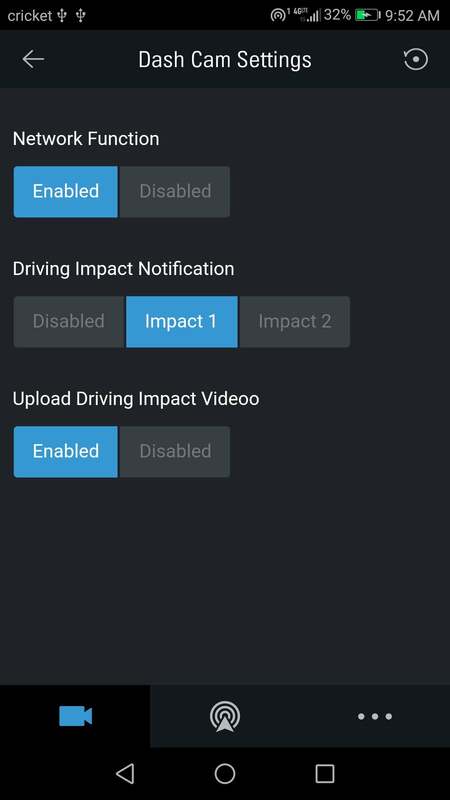 I can only suppose that Thinkware believes that its “bad driver” aids will prevent accidents and driver emergencies of any kind. I’m certain Thinkware will eventually iron all that out, but the real and unsolvable issue with the Thinkware Cloud concept is that it’s totally reliant upon your cell phone and its Internet connectivity. There are simply too many ways for this connection to fail (battery, human error, etc.) for professional use. The Owl’s on-board, always-on Internet is a far better concept for fleet operators (though that camera’s night video remains a weakness). The F800 Pro sports integrated GPS, but you wouldn’t know it from the video, as the location info isn’t included in the watermark. Thinkware provides the viewer shown below to show where you’ve been. Clever, but why no watermark? Having a viewing app to map where you’ve been is a nice perquisite, only it isn’t–it’s required to decode GPS location data. There’s no watermark on the video. As I said, the F800 Pro offers ADAS (Advanced Driver Assistance System) features such as lane departure and collision warnings, as well as a tardy departure warning. 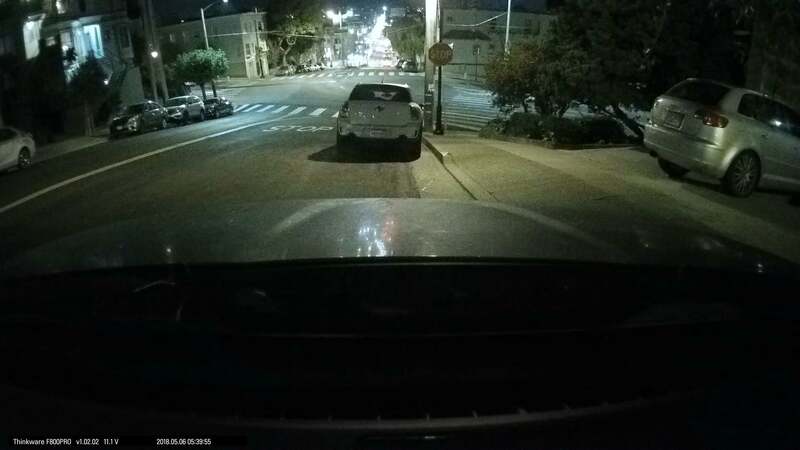 That is, if you’re asleep at the wheel as the traffic in front of you starts moving, you receive a gentle reminder to get off the brake and accelerate. I’m going to say it yet again: If you think these are features you need, take more lessons or get off the road. The life you save may be mine. More handy for competent but aggressive drivers are warnings about red lights and red light cameras, speed zones, and mobile enforcement zones. All that info can make you feel incredibly well-informed, and who knows–maybe the feedback will improve your driving. I turn them all off because I don’t speed (much) and have a healthy respect for the chaos surrounding me on the roadways. The F800 Pro’s day captures are top-notch, but that’s a claim many a cheaper camera can make. What sets the F800 and hence, the F800 Pro apart is the superior quality of their night captures. Though not as saturated as some day time video we’ve seen, the superior processing on the F800 Pro makes details stand out. Details are readily apparent in the F800 Pro’s daytime captures, though the color palette isn’t as saturated as we’ve see with HDR cameras such as the Viofo A119 and the more recently reviewed Z-Edge Z4. This is by far the most revelatory video I’ve ever taken at this spot. Outside of the F800 that is. Though night video has improved greatly across the industry, this is still easily the best you’ll see. As you can see above, the F800 Pro’s night captures are nothing short of superb–best in the business, and it’s not particularly close. The F800 Pro also captures in parking mode at a storage-conserving 2 frames per second. The video is equally high-quality, but you’ll need to hardwire the camera to a constant 12-volt source to use parking mode. The F800 Pro, along with the plain F800, deliver easily the best night video I’ve ever seen–front and rear. If that’s important to you, and you’re phone-centric, then these are the best dash cams out there. Then again, night video has improved quite a bit across the industry, even in cameras far less expensive than Thinkware’s. Many also have on-board display, controls and setup, which, while perhaps not as “cool” as phone control, will work without a phone around. The Thinkware Cloud, while a handy feature, relies on your phone being present and operational. That’s an obvious a failure point for professional use. In my humble opinion, re-thinking the entire concept might be order.